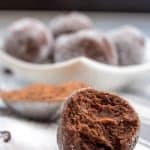 A velvety, rich Chocolate Truffles Recipe – ready in two minutes or less! Who doesn’t love a good chocolate recipe? I’ve heard it said that women cannot live without chocolate. Could a woman live without chocolate? Yes, I’m sure she could, but why would she want to? The good news is that as a Trim Healthy Mama, you don’t have to live without chocolate! There are so many chocolate recipes available. A few of my favorites are 2 Ingredient Fudge, Chocolate Cupcakes with Whipped Cream Cheese Frosting, and Triple Chocolate Fudge Cake. If you do not like to cook or bake, there are even chocolate options available for purchase. Trim Healthy Mama now has their own chocolate bars (available in Milk or Dark), and they sell Sugar Free Chocolate Chips, too! The Chocolate Chips are amazing – I’ve had to portion mine out so I don’t fly through them! And both the Milk and Dark Chocolate bars are delicious – even my kids love them. Another on-plan option is Lily’s Chocolate. You can find these in a lot of natural foods stores, or you can order them online. My favorite bar is the Salted Almond Milk Chocolate Bar. I am often asked where is the best place to buy Lily’s Chocolate. Lucky Vitamin has the best price that I have found – $5.16 for a bag (and sometimes cheaper, when they run a sale). I will confess right now that I have a sweet tooth, so I am constantly looking for a dessert that is easy and FAST! This recipe definitely falls into the fast category. It should take you about two minutes to whip everything together! And while you’re at it, you may want to make a double or triple batch to keep in your refrigerator! Now, I mentioned at the beginning of this post that this recipe may not qualify as a “true” truffles recipe. That is because true truffles rely on a mixture of bittersweet chocolate and heavy cream. These truffles use neither of those (though you can add some sugar free chocolate chips if you want). The secret ingredient in these delicious little chocolate truffles is . . . peanut flour! Peanut flour and cocoa powder are what give these truffles their velvety consistency – they are the perfect texture. This recipe is so simple to make – not counting vanilla and salt, this recipe has exactly 5 ingredients. And did I mention that is is dairy free? 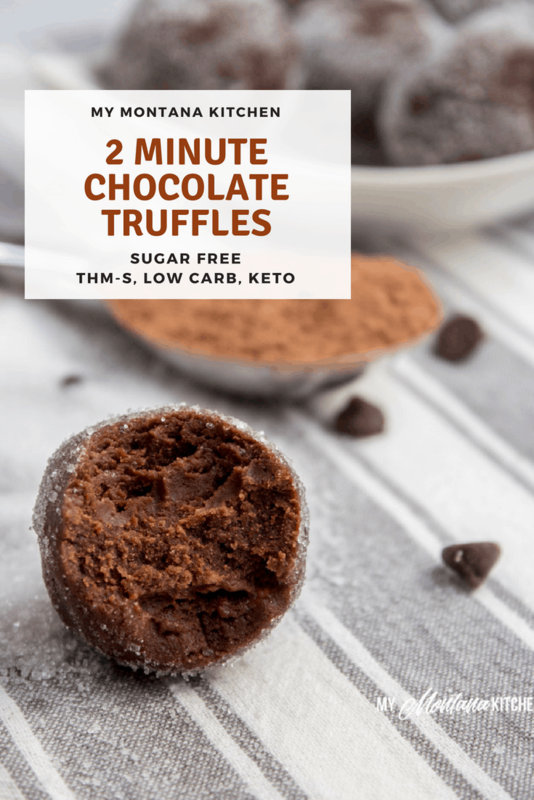 These 2 Minute Truffles are delicious and include a whole tablespoon of coconut oil. What a fun way to get in your daily dose! You certainly don’t have to shape them into truffles to eat them. I usually eat mine straight out of the bowl with a spoon. These are simple enough that even your children could mix them up. Or, if you like to plan ahead, mix up the dry ingredients and store them in little Ziploc bags. Then all you have to do is add the water and coconut oil! The sugar free chocolate chips are completely optional, so if you do not have them, no problem! The truffles will still be velvety rich even without the chocolate chips. 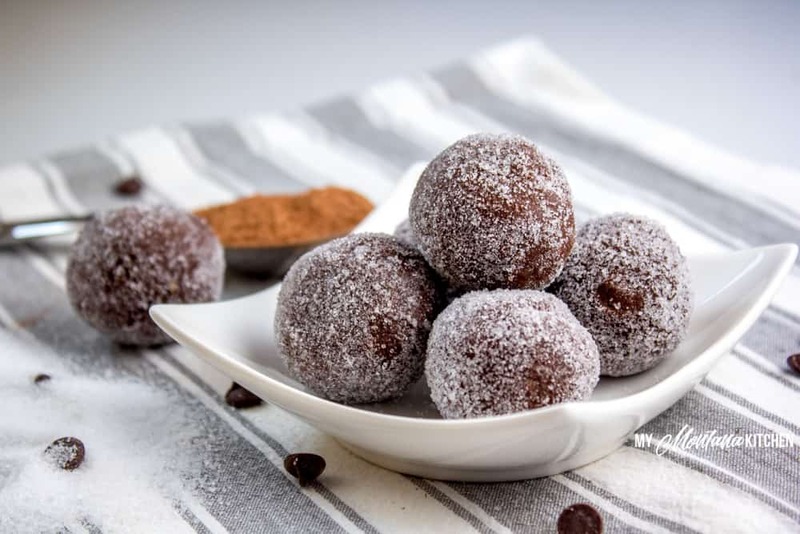 If you want to be extra fancy, you could roll the truffles in granulated erythritol, unsweetened finely shredded toasted coconut, or even finely chopped nuts. If desired, you can roll the truffles in granulated erythritol, unsweetened coconut, or chopped nuts. 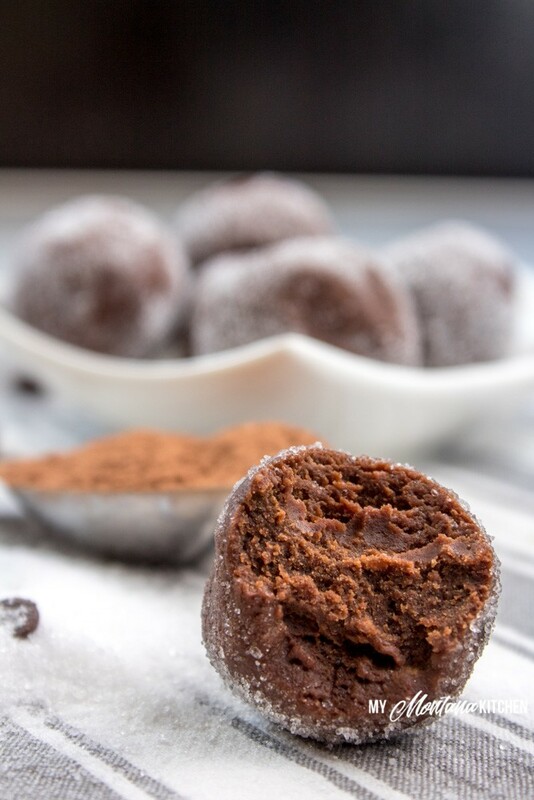 If you need a quick sweet treat, try this 2 Minute Chocolate Truffles Recipe. Seriously, you can have a decadent, velvety, rich truffle in less than 2 minutes - and with NO guilt! Place all ingredients in a dish, and stir to mix. Shape into balls for truffles, or just eat with a spoon! If you do not have the Gentle Sweet, you can use my Low Carb Powdered Sugar in equal amounts. If desired, you can roll the truffles in granulated erythritol, unsweetened shredded coconut, or chopped nuts. If you love Lily’s chocolate, but cannot find them near you, would you consider using my affiliate link to order through Lucky Vitamin? They have the best price on Lily’s Bars and Lilly’s Chocolate Chips that I have found online. If you are interested, check it out here. How much Truvia could I use in replacement of gentle sweet? Thanks! ? These look SO rich! But I would still *try* and eat more than 2!!! What a yummy little chocolaty no bake recipe. We both have our minds on chocolate this week. Great minds work better on chocolate! I love peanut flour, too. It is such a nice low carb and high protein flour alternative. I love how you used it with chocolate to make these truffles. And the limited serving size is perfect because I’d be snacking on these babies all day! These look so awesome, I am a huge fan of truffles! I love that these only take two minutes to make! This recipe is perfect for getting that chocolate fix but without all the sugar! Thanks for sharing! I love peanut flour! It’s so versatile. I’m sure these truffles are amazing. Nom nom! 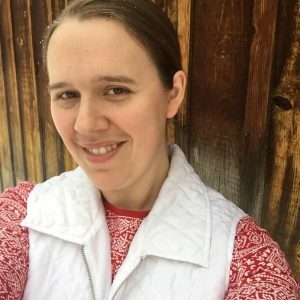 I’ve been slipping lately and this is a timely reminder you can make something yummy and skip the sugary cookies! Any chance I could sub out almond flour or coconut flour? I’m new to thm and I’ve been slowly building up my ingredients but I don’t have any peanut flour yet! I made these yesterday for the first time. It doesn’t say whether to melt or soften the coconut oil, so I tried with it in the solid form and ended up having to microwave my mixture a bit to be able to roll it into balls. I think I might try to make a quadruple batch today. Question- could I use mct oil in place of part or all of the coconut oil? Any substitution for the peanut flour for those with nut allergies? I wish I could hug you! These are life saving. I kid you not! Best sugar free chocolate I’ve made. Yay! I’m so glad you like them!! Any way to make them just peanut butter truffles without the cocoa. I use better body foods peanut butter powder. But *gasp* my husband doesn’t like chocolate stuff. So I doubt he would eat them with the cocoa powder. I think they would still be ok – just omit the cocoa powder. You may want to reduce the liquid a bit, too. I think you could just use more peanut flour in place of the cocoa powder. That would keep the volume of dry ingredients the same, and you’d have tasty peanut truffles. I wonder if that would scratch the tiger butter itch. So good! I like skinny chocolate but like an alternative sometimes. Had to hide them from the kids! Thank you! I saw this on THM’s facebook someone was talking about. I decided to make these. Ok so these were very tasty and very quick! These are brilliant!! I was craving something chocolaty something fierce, to the point of wanting to drive all the way across town to buy a Lily’s bar. Instead, I remembered I had printed this recipe. Voila! Chocolate craving fixed. I’m a happy girl. Yay!!! They do pack a lovely chocolate punch! My daughter and I just made these. I changed the recipe just a bit by using butter since I did not have any refined coconut oil. I had cooking coconut oil on hand and could smell the coconut flavor. They were a little bitter. We may have put too much unsweetened chocolate powder. How fun!! 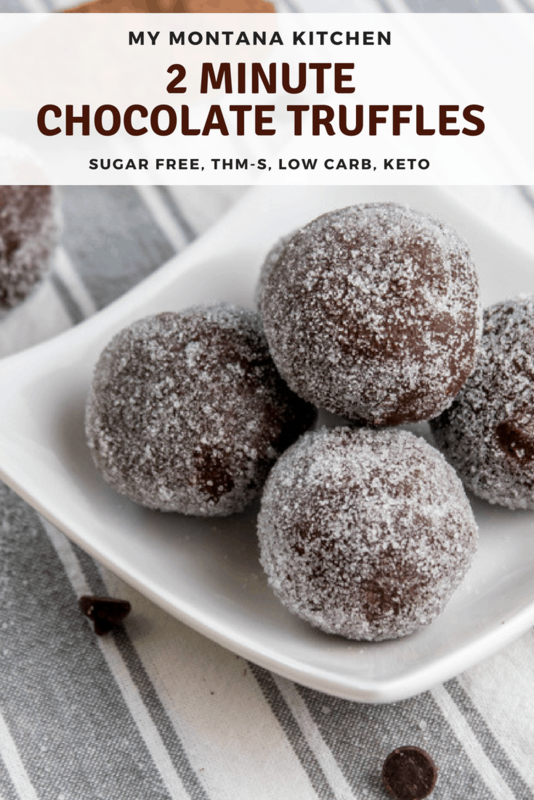 I actually made these last night and today with the unrefined coconut oil (that tastes like coconut), and I think they were BETTER than using the refined oil! You couldn’t really taste the peanut flour, it was like a chocolate coconut truffle! That is good to know because I have this super duper sized container of refined cooking coconut oil from Sam’s that I really need to use. I made them again tonight with butter again. I am using them to get used to gentle sweet. My stomach has not taken too kindly to that “x” sugar or that “e” sugar. How many truffles should this make? I usually get 2 truffles. This recipe has been SUCH a favorite of mine! I’m not always good about keeping skinny chocolate etc prepared and this is so easy to make! Thank you. Is Peanut Flour the same thing as Peanut Powder? Both say they are Reduced Fat and made from real peanuts. I already have the Peanut Powder on hand but want to know if it can be substituted for the Peanut Flour. Thank you! I’m so thankful to have discovered this sweet little recipe. Since I don’t like the artificial (even THM) sweeteners but love the taste of cocoa, I’ve found this recipe to be great using 1/2 the amount of Gentle Sweet. Echoing those who use unrefined coconut oil (delicious). Also, tonight I used real peanut butter and it was amazing. I’m assuming that it changes the nutritional content quite a bit, but so great. Thank you for making this recipe. It really helps when I’m about to eat something terrible for myself at 10pm! Yuuummmm!! I made a chocolate mint version tonight & the original as well. For the chocolate mint, I used a few drops of mint extract, almond flour instead of peanut flour & added the other ingredients as listed in the recipe above. These will be my quick chocolate fix this week! Thanks for the recipe! Pretty sure I could eat 10 of these little devils. I have been enjoying these often lately! They are just so easy and peanut butter and chocolate is my favorite combo. Thank you for sharing your talent – I love so many of your delicious recipes. I’ve been having major chocolate cravings this week. These will be perfect! Thank you! These sound deliciously dangerous and so easy to make. I love the fact that they are gluten-free to and can’t wait to try them out. Mid-afternoon slump will be no more! These would be SO dangerous in my house! They look divine! Yummm!! these look great, and I am thinking a great idea for a gift for the holidays! Saving for later! I love these! So easy and hot the spot when I want something sweet. My 2 favorite flavors together. These are delicious! I have made them twice so far – the first time I ate the mixture with a spoon! Tonight I made a quadruple recipe and then rolled them into mini truffles as a dessert for my family. Everyone loved them! Thanks for sharing – it’s nice to have a truly two minute recipe up my sleeve for when the cravings hit. ps If anyone wonders, I used 3/4t of Pyure for a perfect semi-sweet flavor. Just made these and they’re soooo good! They really did take just 2 minutes too. I rolled them up into eight tiny balls and roll goes into pure granulated erythritol. PERFECT for my nighttime treat! Thank you! !